forest fire equipment compactly packed! In the next years the wildfire frequency will increase with the climate change. In recent years mainly forests in tropical areas became victims of fire; in the future forests in temperate zones like Central-Europe will also be more affected. The seats of fire are often not available for vehicles, thus the equipment has to be transported arduously. With the Backpack Forest rescue-tec offers a nice and cheap solution for transportation and using the wildfire & rural firefighting equipment. steep area – the hands stay free. • Everything of significance for rural fires is clearly stored in one place. in their capacity most of the time. mobile. It promotes a dynamic nozzle management. take the protective googles and half masks which are stored in the backpack. fields or meadows – faster than it would be possible with a bigger, heavier hose. 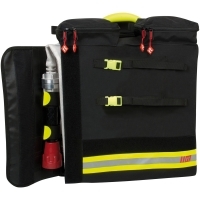 • The backpack forest is easy to fill due to, its two separate hose compartments. You can decide between laying the hoses or rolling them. The rescue-tec backpack Forest optimizes your operations.